I’ve fallen in love with Michael Powell stamps. I’ve been looking at (and admiring) his work for a while and when I saw the stamps, I just had to have them! They’re not that easy to colour, given the amount of detail in them, but I love the whimsical nature of them. 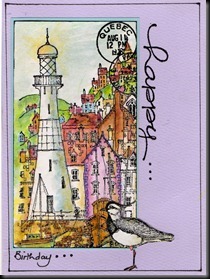 I especially love the seaside images – so evocative and especially at this time of year. I’ve stamped a few but this is the first card I made with one of them. My poor peewit lost a leg while being glued on and broke the other, so that needs to be fixed but I’ll sort that when the temperature’s a little cooler! I’ve been cooking stuff early this morning, before it gets hot again, because this kitchen is South facing and gets HOT later on – especially if we put the oven on! Time to get some lesson prep done, then I need to get some journal pages done for the mingle I’m in. Oops! Last minute Katy, as ever! Oops – it’s been ages since I blogged – sorry. on 22 May AND I had an email to say I made Top Three over at Fashionable Stampers, though I honestly can’t remember which ‘thing’ I entered! Must go check and thanks for the honour! 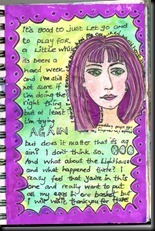 Not much artwork, though, other than a bit of journalling. It’s been a strange couple of weeks all in all… I’m reading, gardening and other bits and bobs but have just had no interest in ‘playing’ which is really unusual for me. Here are two of the pages I did but they seem totally disappropriate (He, he – a game we play here) given the gorgeous weather we’re experiencing here right now, but it WAS miserable, wet, cold and grey for most of the 6 weeks before the sun came! I’m really enjoying this 6”x 6” journal – for some reason the page size fits me better and I find it easier to work in – weird, I know. This will be my entry for Crazy Amigos, whose theme this week is BIRDS, one of my favourites! BEWARE third party Credit/Debit card processors! I ordered something from a UK stamping/die company and, to cut a long story short, was double charged. I won’t mention the name of the company (been there…) but it wasn’t their fault at all – it was the third party processor! YET, this ‘lady’ still lied to me about having refunded the money, a week after she promised to ring me back but didn’t… Why, oh why do people have to lie? I had actually recommended them to a couple of other people but now that I know they have no integrity I certainly won’t do it again! All I bought apart from that was the two Dylusions sprays used below, plus the violet, 3 masks/stencils and two Promarkers, which were only £1.50 each. I had already bought the Spring DIs, some seasonal reinkers and some new pencils earlier in the week, so I only went looking for stamps and didn’t find any I fancied, to be honest. Unfortunately, Stamp Camp had pulled out and Lost Coast didn’t come this time and they’re my usual ports of call. I suppose it was ok if you wanted acrylic stamps and T Holtz stuff. I met up with a lot of people I haven’t seen for quite a long time (people I used to see quite a lot more of) and it was lovely. It did, however, get me thinking about time, how transitory life can be and how it can often change so quickly, so I journalled. 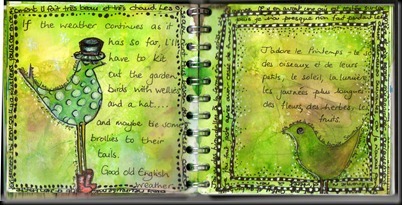 I added a bit of colour to a few pages, stamped a few images then doodled and wrote for a while. Simple and just a bit of fun. The left hand page is a Mask which I found yesterday and thought would be good to write in, so I was just trying it out – I know I can draw that myself but it did generate ideas. I also have a some pages ready to work on, which means I can doodle to my heart’s content while watching TV, lol – not that I do much of that these days. 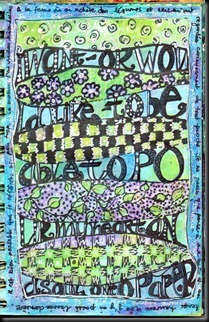 This is my entry for Susi’s wonderful Art Journal Journey challenge, TIME. Bit of a change here because I wanted to do something different, so here’s a Faux Batik card, using one of my favourite stamps from Penny Black, which is also one of my favourite flowers, the Fuchsia. If you’ve never tried this technique before, you should. It’s easy, even though it sounds a little complicated. NOTE: I’VE REWRITTEN THE INSTRUCTIONS BECAUSE I MADE A MISTAKE – SORRY! I DID THIS ONE A LITTLE DIFFERENTLY, WHICH CONFUSED ME. THESE ARE THE CORRECT INSTRUCTIONS! 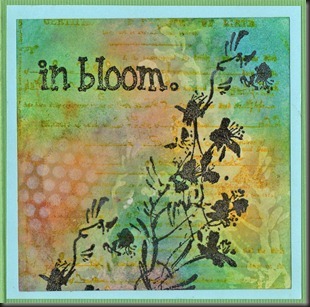 You just emboss your image(s) in clear embossing powder, add colour over it (or them) with water based dye inks, then cover with a paper towel and iron until it melts. You’ll see the EP on the kitchen towel and it will leave a white (ish) image behind, which will also resist inks, if you want to add more colour. For this one, I ironed two sheets together before adding the inks, thus getting a reversed image, which I really like for a change. It also left me with two sheets of faux batik, instead of one! If you want to blend your colours a little more, wipe over with a baby wipe or damp cloth – which is what I did here to remove colour from the original image. Finally, overstamp, as I’ve done below, embossing or not – whichever you prefer. I layered the background colours for more of a 3D effect, leaving the text background over the original image to make it recede even more. Then I added white pigment ink through punchinella to add a further dimension. I love resist techniques of any kind, so this is my entry to the Stampman Challenge – favourite technique. Simon Says Stamp and Show says ‘Show us your favourite stamp’. As this is one of my all time favourites, it definitely applies. Port Sunny tomorrow, so I’m about to check that all is well and find out what time we leave. If you’re going to be there, please do say hello! I love meeting people there and there are a few to meet from KCUK again, including some people I haven’t seen for quite some time. Looking forward to that. Have a great weekend, whatever you’re doing. 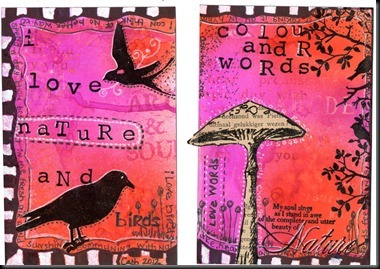 Here are the second lot of pages I made for the journalling mingle on KCUK, with the theme of ‘Things I love/like’. You’ll be seeing more of these because there are nine or ten of us in this mingle. They’ve arrived now, so I’m free to upload them. I did things a little differently this time because I’m sick of destroying expensive pens! So, I did the wording and some of the doodling first, then added colour, using Watercolour paints, Water soluble oil pastels, Prisma pencils and even Tombow pens. This one’s just a bit of fun with Typography. 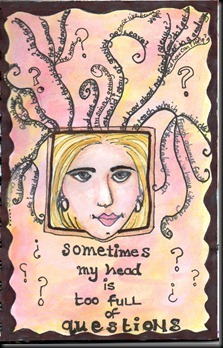 I think this one’s self explanatory – it’s about Questions, lol. Here’s a tag I made very quickly and sort of revamped. It’s one of my favourite stamps but I don’t use it very often at all. The actual tag was distressed and ironed and was made when Ranger first brought out Distress inks! Hope you’re all having a great Bank Holiday weekend so far. The weather’s been pretty good here today (unusually) – a little on the cool side and especially when the sun went in but bright and cheerful.